Protect your kids while they are away! With Hoverwatch Android Keylogger, you’ll always know where your kids are. 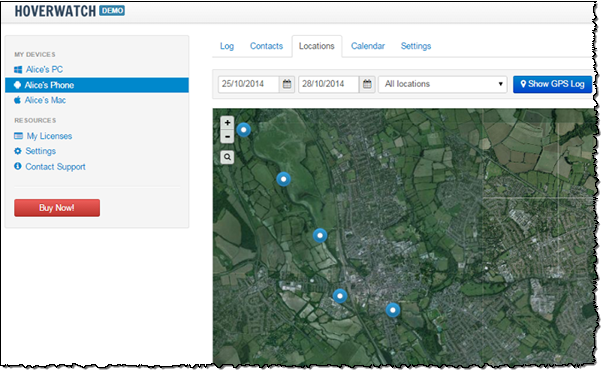 See where they are on the map, watch who they call and text to, and discover what they are up to with Hoverwatch. Running silently on your kids’ phone, Hoverwatch android keylogger is completely invisible. The tool tracks down their phone on the map, saves calls and SMS messages they send and receive, and talk back to you periodically. No matter where your kids are, if there is a Wi-Fi or mobile data connection available, you’ll know everything about your kids in real time! Hoverwatch is designed to help you protect your kids, and to help your kids protect their Android phones from theft or loss. Your phone will be talking back to the server every once in a while. With these periodic reports, you’ll be able to easily locate your kids on the map and see exactly on the map where they’ve been spending their time during the last day, week or month. The very same tracking feature can come handy if the phone gets lost or stolen, helping you pinpoint its location and map the “new owner’s” whereabouts. Unlike many other solutions, Hoverwatch works regardless of whether the phone is locked or not, helping you track your device even if it’s never unlocked. Unlike other solutions, Hoverwatch stores the location of the phone (as defined by the phone’s GPS receiver) every time your kids make a call, launch an app or send an SMS. You’ll know exactly what they did and where they did it. Supporting OpenStreetMap and Google Maps in Roadmap and Satellite modes, Hoverwatch draws a route on the map to let you know exactly where your kids are and what they are (or were) doing there. Track your kids location on the map, monitor their calls and messages with an all-in-one phone tracking solution! Hoverwatch installs on your phone and runs silently ever after – no touching or tweaking required. Hoverwatch reports automatically to a central location, allowing you to access information about your kids location and their phone usage by simply logging in to your account – from anywhere in the world! Hoverwatch keeps information about incoming and outgoing calls, text and MMS messages, records phone calls and sends periodic reports about the phone’s GPS location. In addition, the tool can be configured to take a snap of the user’s face every time the phone is unlocked with the phone’s frontal camera. Protect your device against theft or loss! In addition to tracking your phone in background and reporting its exact coordinates on the map, Hoverwatch can take snap photos with the phone’s front camera every time the device is unlocked. This feature comes handy when the phone is lost or stolen and you just want to know who has it. Hoverwatch is designed for families and parents concerned about their kids’ safety. The ability to run invisibly in background helps parents look after their kids without them even knowing. Continuous monitoring and periodic reporting to a central location enables access to real-time and historic GPS locations from anywhere in the world. The tracking ability along with stored location information helps find your phone on the map in case it gets lost or stolen, while the ability to snap photos of anyone unlocking the device helps identify the new “owner”. GPS location Geolocation information is continuously recorded and periodically transmitted to the central server. The last 30 days of GPS data are stored, enabling easy reconstruction of the user’s whereabouts at any point of time during the past month. Information about incoming and outgoing calls Data about phone calls made and received calls is recorded; the other party is identified with the phone number and address book information. The data is transmitted and stored on the server. SMS messages sent and received The full content and accompanying information about text are recorded, transmitted and stored on the central server. Unlock snapshots If configured, the tool can make snapshots of the person unlocking the phone. This helps find out who used the phone at any particular moment, and helps identify the new “owner” of the device if the phone is lost or stolen. You don’t have to purchase anything to try Hoverwatch. Just download and install the tool to your kids’ Android devices and enjoy the free evaluation period of 3 days.